CEC designed the 4-126 Vibration Sensor for turbine applications. 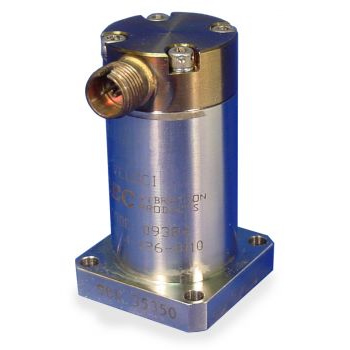 CEC’s 4-126 Vibration Transducers use a seismic magnet that moves on gold bearings. A coil is attached to the case, and movement between the magnet and coil produces the output signal when the case vibrates. CEC designed the 4-126 Vibration Sensor for turbine applications. You can use them in turbine hot sections, such as the turbine case, where high temperatures can cause problems with other sensors. The low impedance, high level output requires no special amplifiers, simplifying your measurement system. They have low sensitivity to transverse accelerations, and you can mount them in any plane. CEC’s 4-126 Vibration Transducers use a seismic magnet that moves on gold bearings. A coil is attached to the case, and movement between the magnet and coil produces the output signal when the case vibrates. This air-damped system operates above its natural frequency so the output is proportional to velocity. The sealed case insures complete protection from contamination. Rugged construction and design simplicity insure high reliability and long service life.